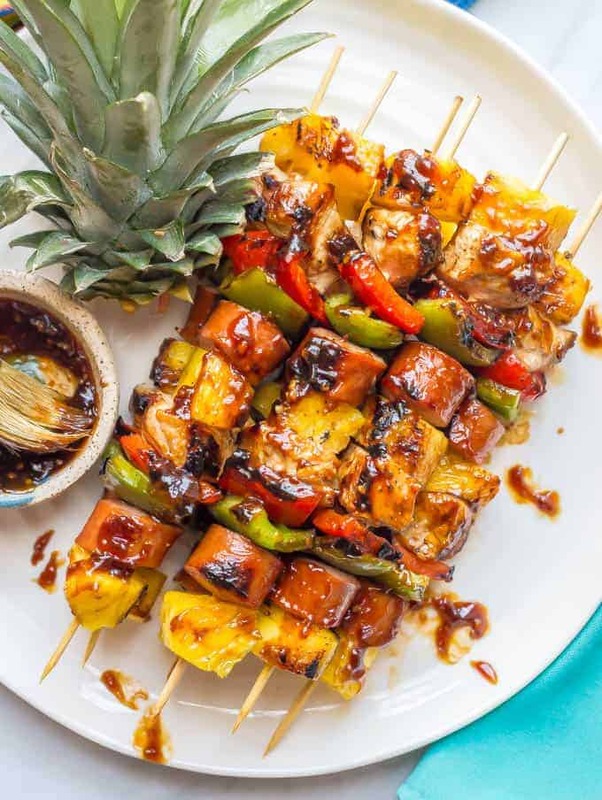 Teriyaki chicken pineapple kabobs are a fun and flavorful recipe for the grill (or oven) with tender chicken, peppers, fresh sweet pineapple and an easy teriyaki sauce that doubles as a marinade and sauce for basting and serving. 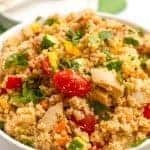 Perfect for a family dinner or a BBQ party! It’s hard to believe it’s been 7 years already – I can remember so clearly being pregnant with her, being in labor with her and holding her as an itty bitty baby. Oh how she loved to be held ALL the time! On the other hand, there have certainly been some LONG days and nights over the years where it seemed like time was slowing down. And there’s been plenty of worry and mom guilt along the way, too. But today I’m going to focus on celebrating the amazing kid she has become. Kabobs to me are such a great family-friendly food. I mean, who doesn’t love dinner on a stick? 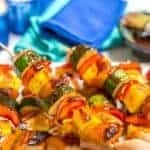 Previously I’ve shared my sausage pineapple kabobs with BBQ sauce and my chili lime chicken kabobs with peppers, farro and creamy adobo sauce. 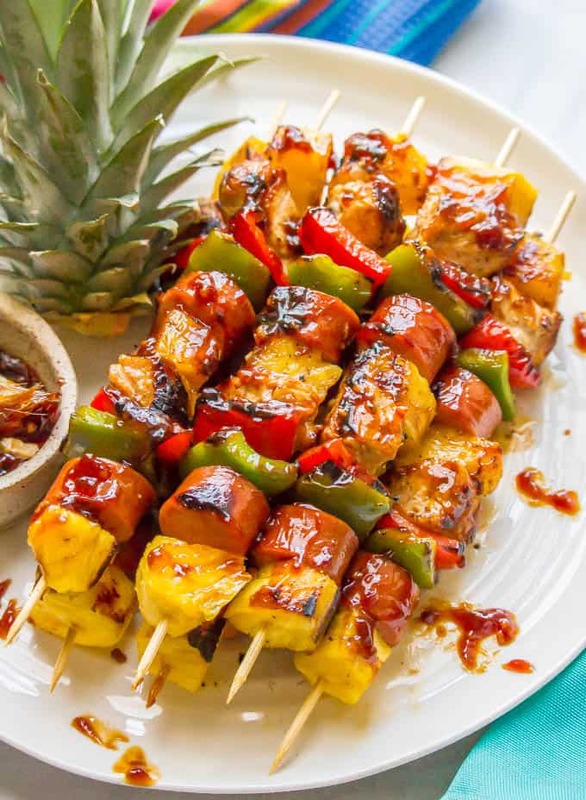 And today’s it’s these fun and flavorful teriyaki chicken pineapple kabobs. 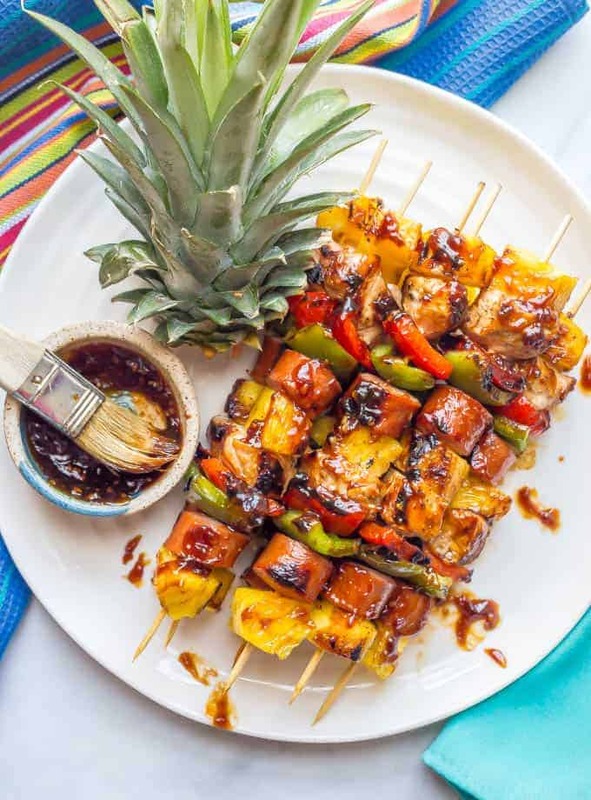 We’ve got chunks of chicken and sausage, peppers, red onions, fresh sweet pineapple chunks with an easy teriyaki sauce to use both as a marinade and to baste with while grilling (or as a dipping sauce to serve). Double-duty! 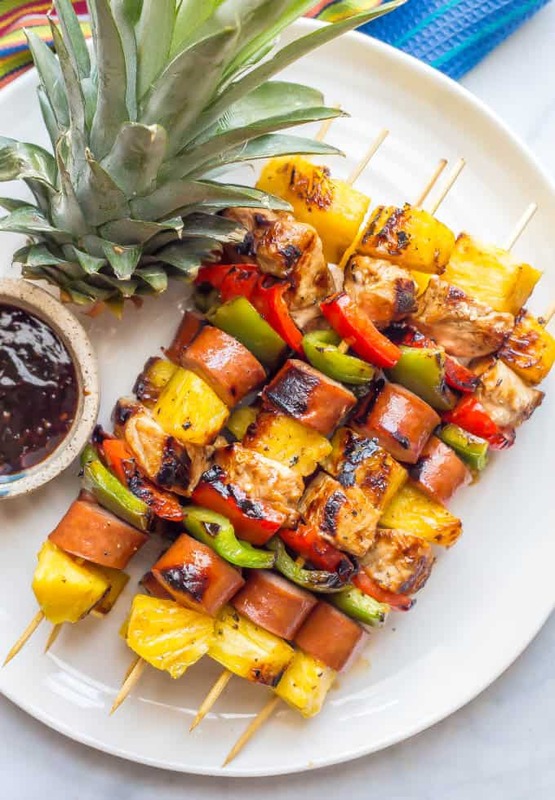 Your weekend BBQ game will be strong with these kabobs! 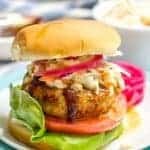 I use a homemade teriyaki sauce, which is part of the recipe below, but you could also pick up a teriyaki marinade at the store if you prefer. Make sure to save some of the sauce before you marinade the chicken to use for basting and/or dipping. No cross-contamination please! If your teriyaki sauce gets too thick as it cooks or as it cools, add a splash or two of water and mix it through until it’s the right consistency. No grill? No problem! You can make kabobs in the oven, too. Bake the kabobs in the middle rack of the oven at 450 degrees for 10-15 minutes, then turn each one over and continue baking for another 10 minutes, until done. Kabob lovers, I hope you give these a try. 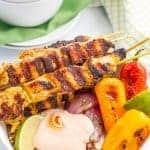 And if you think you are so-so on kabobs, make these — they are sure to sway you! 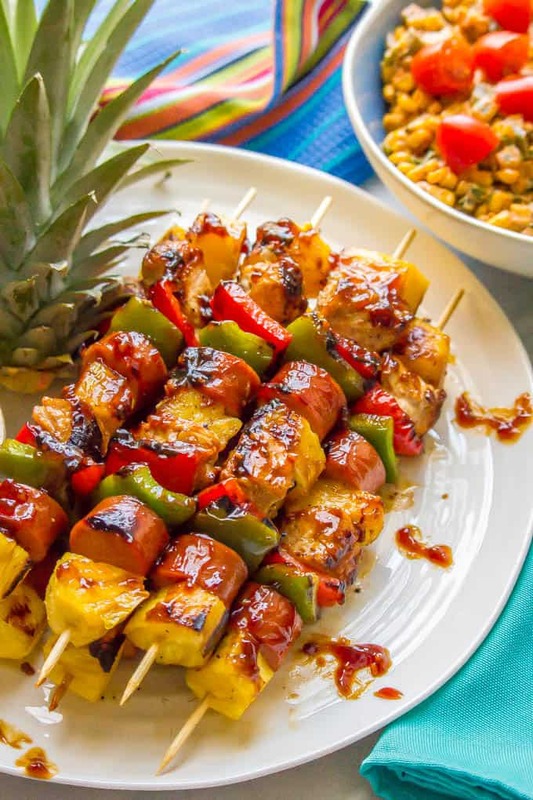 Teriyaki chicken pineapple kabobs are a fun and flavorful recipe for the grill (or oven) for dinner or a BBQ party! Place the chicken pieces in a large ziploc bag and add the teriyaki marinade (all but the reserved part) and toss to coat the chicken pieces. Marinade chicken for at least 30 minutes (2 hours is better if you’ve got it). Meanwhile, soak your skewers in a dish with water so they don’t burn on the grill. I use an 8x8 pan and fill it with a half-inch or so of water. 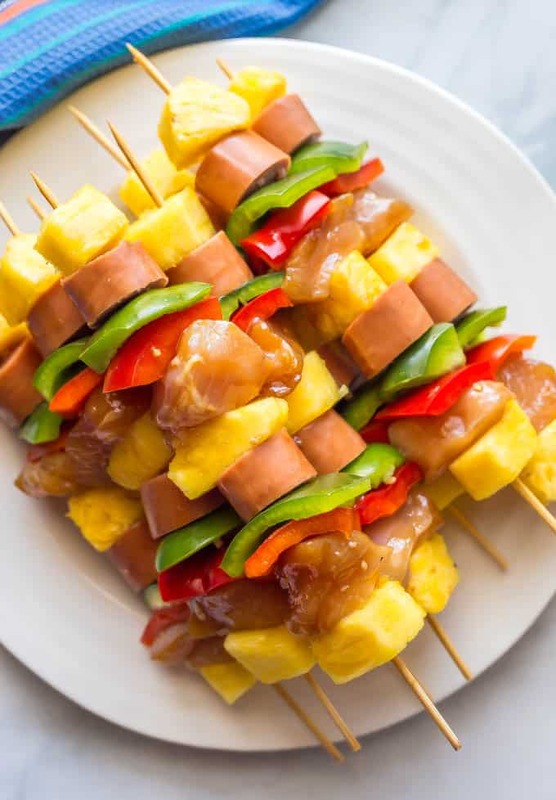 Assemble kabobs: Thread the marinated chicken, peppers, pineapple and sausage onto the soaked skewers. Grill the kabobs over medium heat for 10-12 minutes, turning occasionally, until the chicken is cooked through, the sausage is warmed and the veggies are softened. Brush with reserved teriyaki sauce at the end of the grilling time or serve the sauce on the side for dipping. 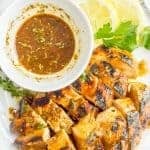 I use a homemade teriyaki sauce, which is part of the recipe below, but you could also pick up a teriyaki marinade at the store if you’d prefer. If your teriyaki sauce gets to thick as it cooks or as it cools, add a splash or two of water and mix it through until it’s the right consistency. 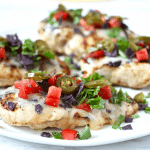 These are beautiful – and perfect for Memorial Day! Hang in there Mama – watching your babies grow up is so much fun and so sad at the same time!